Written by Rosemarie Parent using archival information preserved by the Arrow Lakes Historical Society and the Society’s publications. Grand Hotel, Nakusp, ca. 1920, with group posing on balcony. L-R: Mrs. Frank Hughes, Rose Labrash, Mrs. Labrash, Lila Labrash, ?, ?. Before 1892, work had begun clearing Nakusp’s waterfront. Also because of the mining in the Kootenays and the necessity of finding ways into the rich mineral finds, Captain Robert Sanderson, William Cowan and Frederick Hume formed a company called the Columbia Transportation Company to provide boat service on the Arrow Lakes from Revelstoke to Sproat’s Landing in 1888. The CPR sent out engineers and survey parties to explore the country lying between Nakusp and Slocan Lake in 1891. Early in 1892 estimates for the cost of a railway from Nakusp to Three Forks were submitted as well. All the hype of mining activity, boat building and CPR involvement brought the need for accommodation at Nakusp for the entrepreneurs and workers. 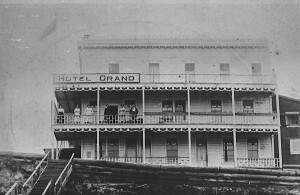 The Leland Hotel, formerly called the Rathwell House, was built very shortly after the Grand Hotel was erected in 1892. At this time there was another small hotel built all of logs called the Prospect House, which was built some distance away from the waterfront on Slocan Ave., near where Pat and Laura Beingessner live now (2006). Another log hotel was built late in 1892 named the Columbia House, which was situated on Broadway St. next to the Bon Marche. On Bay St. below the Leland Hotel was another hotel also built in 1892 called the Hotel Nakusp, which sat just above the boat landing. This little hotel burned about 1902. The Grand Hotel, was originally named the Nakusp House and later the Madden House for some years. It was the first to be built in Nakusp, just before the Leland, the Columbia House, Prospect House and the Hotel Nakusp. When these hotels were built, conditions were quite primitive but mainly were used in those early days by construction workers and business people. There were no children and women on the scene for a few more years. Alan McDougald brought in Nakusp’s first piano and by 1894, several dances were held at the Grand Hotel and Prospect House. There was a Valentine’s Ball held at the Leland to help pay off the school debt and McDougald hosted a men’s supper in celebration of Burns Night. Hugh Madden took on James McNeil as a partner in 1894. The upper storey was finished where they added more rooms. A new verandah was put across the entire front of the building. Also in 1894, Hugh Madden sold his interest in the hotel to J. McGeary. In 1897, the hotel had added a three-storey block on the south side. This was to better cope with the increasing traffic, which they were experiencing each week. It was a frontier-town-like hotel, artistically adorned with scallops, cornices and fancy window trim. The roof was crowned with ornate fretwork while the balustrade posts of the upper balcony were all topped with perfect round balls. This large balcony provided an escape route in case of fire, as well as a fine resting and viewing area from the west and south walls. The ground and lower floors were also extended on the south side in the same manner, to provide seating space for their guests. Mrs. Manuel and her daughter were in charge of the dining room and Mr. Cummings ran the bar. On viewing his hotel, which resembled a wedding cake after the work was completed, McNeil, the sole owner of the hotel since 1897, felt the name Madden House should be changed to the Grand Hotel. James McNeil lost his wife, Sadie just 20 years old, in childbirth August of 1897; their daughter, Sadie Eileen, died about a month later. As happened often in those early days of no doctors or hospitals, young pregnant women were vulnerable to complications. To honour his wife and child, James purchased a lot on the south side of the west Broadway extension, which measured 50 ft. by 115 ft., fenced it and designated the area as a Catholic cemetery. You can see their graves at the top left of the cemetery. The baby’s grave has a little lamb on top. (James’ body was also interned in the Catholic cemetery in an unmarked grave in 1939.) This sad event possibly helped to bring together the nucleus of a Catholic organization in Nakusp. In 1899, James McNeil surprised his many friends when he decided to leave. Thomas Abriel had taken over the proprietorship and hired Lyle McDougald as his bartender. Mrs. Leduc came to run the dining room. John Hector was the next owner when on June 20, 1902, he bought the hotel from Tom Abriel. An avid token collector, Ron Greene, a fellow member of the BC Historical Federation, contacted our society about John when he was doing research about tokens with the Hector name and Grand Hotel on it. He narrowed down the information in a Kootenay Mail newspaper and an obituary notice. We had not come across the token but it was much appreciated to receive this new information about the Grand Hotel for our records. John had come to Nakusp about 1884 and worked as a bartender at the Prospect House. He married Augusta Nilsson, also a native of Sweden, on 6 May 1895. By 1897, Hector was the proprietor of the Columbia House. He was involved with other businesses as well before he took over the Grand Hotel in 1902. In January of 1906, Michael McCarthy, a station agent at Rosebery, bought the Grand Hotel and Addie, his wife, ran the business for him, while he remained at his job in Rosebery. The CPR transferred McCarthy to Chalk River, Ontario, where he was accidentally killed. Addie was devastated and could no longer continue at the hotel so her mother, Mrs. Antoya, and stepfather, Harry Labrash, bought the business from her. 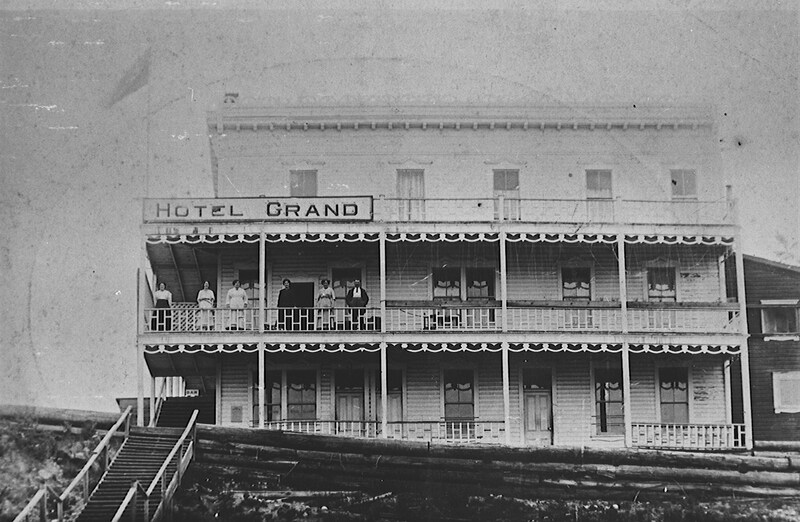 For a short time in 1910, the names Haigh and Dougall show as proprietors of the Grand. However, late that year John (Jack) and Agnes Latten Thew took over. Agnes was a go-getter and a seasoned hotel and bar operator. One year, she won an award in Revelstoke from a liquor company for having sold the most of their product for all of BC out of a single outlet. She tolerated no abuse or profanity and often had to serve in the dining room because of a lack of help. Local girls were reluctant to mix with some of the less appealing guests. Room and board at this time was $1 per day. Whiskey was $1 per bottle, sugar $5 per 100 lbs. and flour was $2.50 per 100 lbs. They had a well but bought water from Abriel for 25 cents a barrel. In 1913, Frank Hughes bought the hotel from the Thews. Jack also had staked several loggers for horses and equipment and they could not pay their bills. He bought 10 acres in Glenbank near Carson’s Corner (2006) and made an arrangement with Andy Symonds whereby Andy would pay the wages owed by these men by supplying Jack with lumber from his mill. Mr. and Mrs. Harry LaBrash took over the hotel again a short time later but in May 1919, Frank Hughes son, also named Frank, took over the management. By 1924, Eastman and Swanson were the proprietors. On the morning of 2 September 1925, a fire started in the cellar of the Grand and quickly burned through the thirty-year-old structure. Though the fire brigade worked valiantly, they were not able to save the building. However, they prevented the fire from spreading to nearby buildings and there was no loss of life. From that day in 1925 to the present time, in spite of the value of the property both commercially and aesthetically, no one has sought to re-establish a business there – a mystery indeed.